A red-hot fuzz pedal that's great for tight spaces. Plenty of attitude in the tones. Battery is a good backup. Battery will need replacing, eventually. Quiet. 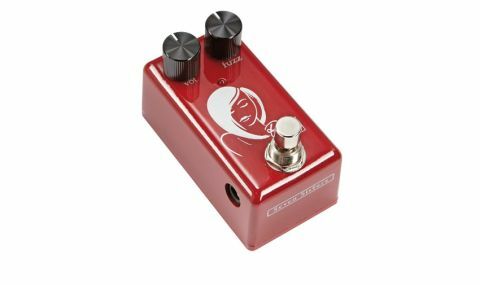 Another of Red Witch's diminutive Seven Sisters stompbox range, the Ruby offers a functional two-knob fuzz, and 300 hours of use from a single charge of it's lithium battery, alternatively/in addition you can use a 9v adaptor. "Ruby's not a polite lady; what she gives you is raucous, spitty fuzz with an attitude. We like it"
Volume and fuzz knobs dial in the sound, which is voiced somewhat like sister model the Fuzz God II with its sputter knob fixed at around 2 o'clock. Ruby's not a polite lady; what she gives you is raucous, spitty fuzz with an attitude. We like it. So what of the battery? Well, considering that most of us run our pedals off a power supply rather than batteries these days, and you do need an adaptor to charge it anyway, perhaps it's not that relevant. It will impact in two ways, though: one (good) is that it will still work if your power supply goes down onstage; and the other (er, not so good) being that lithium batteries need replacing every couple of years. Characterful fuzz with plenty of appeal, although a little more output would have been nice, rather than having to keep the volume knob almost fully up.